Thanksgiving is almost here and with that comes a desire to spend more time in the kitchen. My in-laws, Linda and Travis just got into town yesterday and we wanted a special meal to welcome them. I turned to one of my favorite cookbooks; Rick Bayless’s Mexican Kitchen. Rick’s cooking show on PBS was my first introduction to his talents. I believe that a meal should have a story and Rick does an outstanding job of weaving in the story of each dish. The sweetness and texture of the pork with the smoky flavor of the chipotle and the subtle hint of the toasted almonds are part of what sets this dish apart. We served on warm corn and flour tortillas, added some lettuce, fresh tomato and a classic refried black bean also from Rick’s Mexican Kitchen cookbook. In a medium-sized sauce pan, cover meat with heavily salted water. Peel and roughly chop 2 cloves of the garlic and add to the pan, along with half the onion. Bring to a gentle boil. Skim off any grayish foam that rises during the first few minutes. Partially cover and simmer over medium-low heat until thoroughly tender, about 1 ½ hours. If time permits, cool the meat in the broth. Shred it with two forks. Heat a heavy skillet and roast the remaining 3 cloves of unpeeled garlic until soft, turning occasionally (about 15 minutes). Cool and peel. Roast the tomatoes on a baking sheet under a very hot broiler until blackened on one side, about 6 minutes. Flip and roast the other side. Cool, then peel, collecting all the juices with the tomatoes. In a blender, pulse the tomatoes, garlic, and chiles to a medium-fine puree. Heat 1 Tbs of oil in a heavy sauce pan over medium-high heat. Add the puree and stir for about 5 minutes as it sears and thickens. Season with salt. In a large non-stick skillet, heat the remaining 1 ½ Tbs of oil over medium-high heat. Add the shredded pork and remaining half an onion. Fry, stirring and scraping up the browned bits, until the mixture is crispy and golden, about 12-14 minutes. Sprinkle the cinnamon, pepper, cloves, and raisins over the meat. Pour on the tomato-chipotle sauce. Reduce heat to medium and simmer, stirring occasionally, until nearly all the liquid has evaporated, 4-5 minutes. Turn on the oven to 350 degrees. Toast the almonds in a small baking pan until fragrant and lightly browned. Watch carefully so they don’t burn. Stir them into the meat mixture. Taste and season with more salt if necessary. 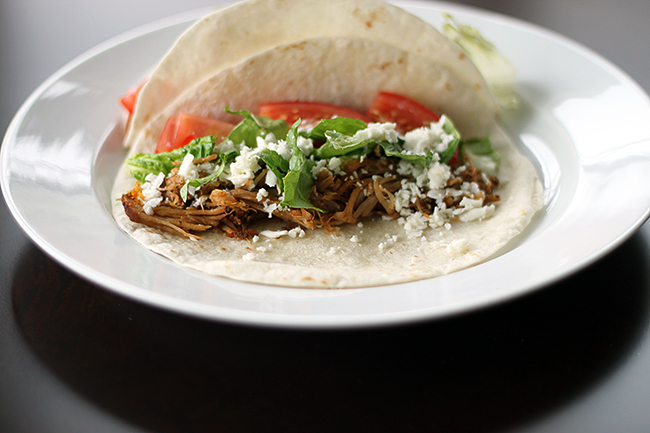 Steam the tortillas in a steamer or in a microwave between damp paper towels. Scoop a couple of heaping tablespoons of filling into each warm tortilla and fold over. Add hot sauce if desired.